Shrimp goes with garlic like peanut butter goes with jelly. Don’t believe us? Try the duo for yourself with these delicious recipes—all of which are even better if you follow Jonathan Waxman’s garlic prep tips. This quick and easy dish pairs shrimp and garlic with their other favorite cohort—butter. For a perfect party dish, simply grill up these garlicky shrimp and serve them with a chutney-like dipping sauce. The classic garlicky shrimp dish is a meal in itself served simply with bread. Based on a popular Spanish tapa, this simple dish is hearty enough to be served as a main course. These plump shrimp are cooked in a punchy Latin-style sauce with chiles and plenty of garlic. Chunky with capers and olives, this tomato sauces tastes like a puttanesca sauce typically served on pasta. It’s great on garlicky sautéed shrimp. 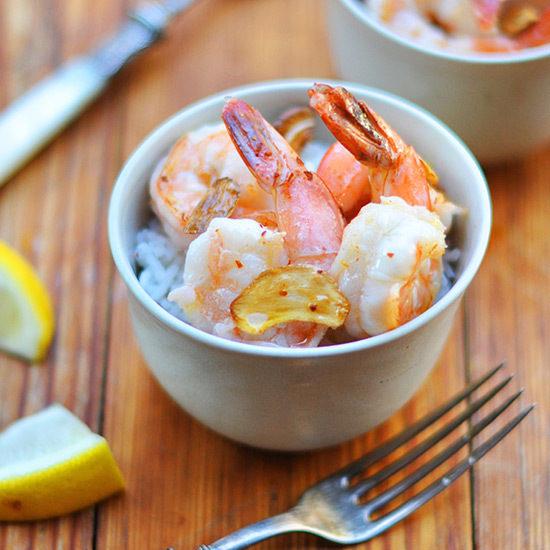 Quickly marinating shrimp in garlic, onion, white wine and lime juice is a great way to prep them for the grill.